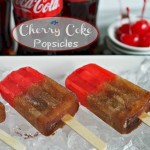 Cherry Coke Popsicles taste like the real thing and are presented in a refreshing little package. Pour maraschino cherry juice over the cherries in each mold to fill 1/3 up each mold. Pour cola over the cherries and juice in each mold - leaving 1/4" head-space in each mold. Cover and place Popsicle sticks down into each Popsicle - push firmly and into the frozen cherry portion.